The postseason has arrived. Go inside the NBA and get unfiltered access to the playoffs. The TrueHoop Stat Geek Smackdown is back for the 2011 playoffs. Who's the playoff MVP thus far? Make your picks and upload them to our YouTube page. How will your team fare in the playoffs? See how the scenarios might play out. Jones (toe) is set to make his return to the Heat's rotation on Thursday, the NBA.com's John Schuhmann reports. Haslem (foot) was held out of Thursday morning's shootaround as a precautionary measure, the South Florida Sun-Sentinel reports. I have to give it up to Lebron. 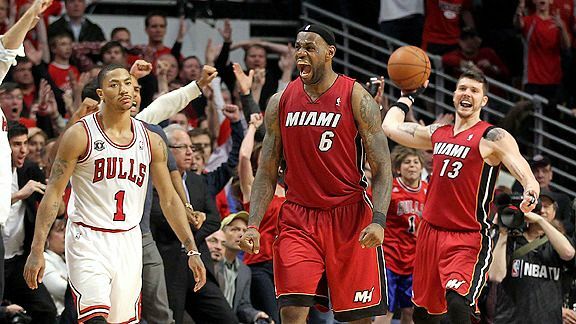 Even though it wasn't the Finals he just took that game over in the final 40 seconds for the Heat. Play Podcast Bill Simmons breaks down the NBA playoffs with ESPN NBA Insider Ric Bucher. Will the Mavericks get exposed for their flaws in the Finals?